Wadah Khanfar: Did he jump or was he pushed? The network, which is owned and bankrolled by the Emir of Qatar but remains editorially independent, broke the mould of traditional Arabic media organisations. The Palestinian’s rise to the top of Al Jazeera was meteoric: between 1985 and 1990, while studying at the University of Jordan, he started a student’s union that soon spread to several other universities. By 1989, the union was playing an active role in debating the future of the democratic process, and Khanfar started making a name for himself as a charismatic and natural leader – not to mention a great public speaker. His first job for Al Jazeera was as a correspondent in South Africa in 1997, before heading to Afghanistan and later Iraq. He set up Al Jazeera’s operation in Baghdad before the start of the second Gulf War, and at the time of the American invasion, was running a team of more than 100 people. The station’s output not only raised the hackles of the invading Americans – who were unhappy that their opponents were being given any kind of airtime – but also irked many Iraqis. But for the most part, the station’s coverage won many plaudits. 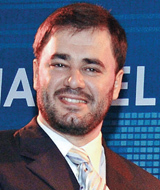 Khanfar’s reward was to become managing director of Al Jazeera in 2003, and director general three years later. Few can argue he did that. By the time he cleared his desk last week, the Al Jazeera Network had grown to 65 bureaus across the globe. The English channel was reaching 220 million households in 100 countries, having just inked a deal with Time Warner to broadcast in New York. During the first few days of the revolution in Egypt, the network’s viewing figures soared by a staggering 2400%. But the bigger the channel, the bigger the challenge. Shortly before Khanfar resigned, WikiLeaks released documents purporting to show the close ties between Khanfar and the US. The leaked 2010 documents indicate that the former director general was in constant contact with the US Defense Intelligence Agency.